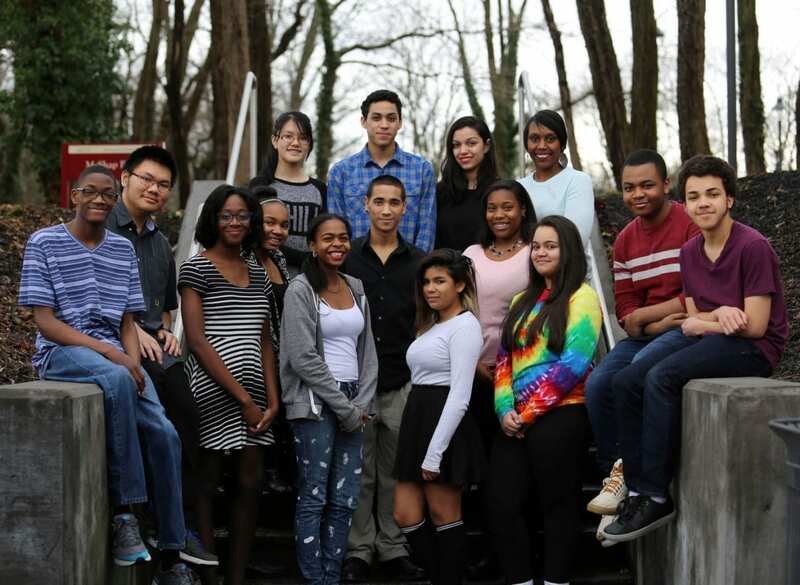 Photo: Current Camden Scholars students with Program Director Dorothy Lopez (standing, back right). Head of School Larry Van Meter recently announced four lead gifts totaling nearly $3 million to begin to endow the school’s Camden Scholars Program. The Program has a 40+ year history of providing nearly full-tuition scholarships for academically talented students with financial need from Camden to attend Moorestown Friends. The school is seeking funds to permanently endow the entire Program. Len Shapiro, ’60, Co-Founder and Co-Owner of Saltchuk Resources, a holding company in the Pacific Northwest involved with maritime business, fuel distribution, and real estate, along with his wife Pat, have donated $1 million in the form of a charitable lead annuity trust. Judy Faulkner ’61, Founder & CEO of Epic Systems Corp., a privately held company that sells healthcare software, and her husband Gordon, have donated $900,000. MFS Trustee Bill Haines, Owner and CEO of Pine Island Cranberry Company, and his wife Nadine, parents of an MFS alumnus and grandparents of a current student, have donated $500,000. MFS Trustee Mindy Holman, Chairman of Holman Automotive Group, and her husband Frank Beideman, parents of two MFS alumni, have also donated $500,000. The Camden Scholars Program at MFS has a long and unique tradition of providing opportunities to students with demonstrated academic potential and financial need from Camden. Currently, two scholars enter MFS each year in seventh grade and one in ninth grade. During a typical school year, there are 16 Camden Scholars at MFS (4 in Middle School and 12 in Upper School). The Camden Scholars receive a nearly-full-tuition scholarship to attend MFS. Lunch, books, fees, technology resources, and transportation via a school-supported bus are all covered by Moorestown Friends. More than 110 Camden Scholars have earned MFS diplomas and moved on to attend some of America’s most selective colleges and universities. Beginning in the 1970s, MFS partnered with A Better Chance, Inc. (ABC), a national non-profit student search, referral, and scholarship organization to bring highly promising Camden students to the school. The goal of ABC was to increase the number of promising minority students in independent schools. When scholarship funding from ABC ended in 1983, the MFS School Committee made the commitment to fund the school’s Camden Scholars Program moving forward. Len Shapiro ’60, Co-Founder and Co-Owner of Saltchuk Resources, grew up in the Erlton section of Cherry Hill. Len is a graduate of Florida Southern College and has an M.B.A. from the Wharton School. The Shapiros reside in Mercer Island, WA. Judy Greenfield Faulkner ’61, Founder and CEO of Epic Systems Corp., also grew up in the Erlton section of Cherry Hill. She has grown Epic from a startup with one and a half partners into an industry leader with an 1,000-acre campus in Verona, WI with over 9,500 employees, and an estimated annual revenue of $2 billion, with a singular focus on healthcare software. Judy has served on the Obama administration’s Health Information Technology Committee. In 2011, she received the MFS Alumni Association’s Alice Stokes Paul Merit Award. In 2015, she signed the Buffett Pledge, committing 99% of her assets to philanthropy. Judy is a graduate of Dickinson College and earned a M.S. in computer science from the University of Wisconsin. Judy resides with her husband Gordon in Madison, WI. MFS Trustee Mindy Holman is Chairman of the Holman Automotive Group. Mindy has served on the MFS School Committee since 2011. She is Chair of the Board of Directors for the United Way of Greater Philadelphia and South Jersey and is a co-founder and Vice Chair of the Community Foundation of South Jersey. Her husband Frank Beideman is the Executive Vice President of Human Resources at Holman Automotive. Mindy and Frank reside in Moorestown and are parents of two MFS alumni: Brad Beideman ‘12, a student at Emerson College and Joe Beideman ‘15, a student at Elon University. A fourth generation cranberry grower, Bill Haines’ company is the largest cranberry grower in New Jersey and fifth largest in the nation. His wife Nadine is an attorney. Bill is on the Board of Directors at Ocean Spray. He is a former mayor of Washington Township, and served on the Burlington County Board of Chosen Freeholders, where he was instrumental in the expansion of the county’s farmland and open space preservation programs. Bill has served on the MFS School Committee since 2014. Between them, Bill and Nadine have six children. Bill is the father of MFS alumnus William S. “Tug” Haines III ’97. They live in Medford.